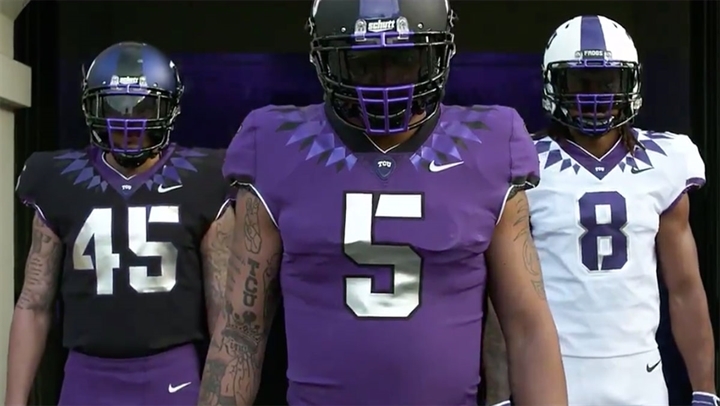 The Horned Frogs are ditching the frog-skin uniform effect heading forward. TCU football unveiled new Nike Vapor Untouchable jerseys for the 2019 season on Wednesday in an emotional video narrated by former Horned Frogs safety Derrick Kindred. The video references TCU coach Gary Patterson’s humble upbringing in Rozel, Kan., and the underdog mentality that has helped the program rise to a nationally-relevant Power Five team. Clips from LaDainian Tomlinson, Andy Dalton and Josh Doctson are featured prominently. “The saying goes, to those much is given, much is expected,” Kindred narrates in the reveal video. “But how about to those to whom nothing is given? To those of us born with a chip on our shoulder, even more. Without that chip, there’s no Coach P, there’s no LT, there’s no Rose Bowl or comeback. Three jerseys were revealed in the video: a black, a white and a main purple uniform. Additionally, the video featured a white helmet, a black helmet and a purple helmet. The new uniforms are a simpler solid color on the base, but with a collar effect meant to reference the famous Horned Frog logo. The collar adornment is purple on all three uniforms, but with a silver adornment on the white jerseys and black on the others. TCU’s black and purple jerseys each feature silver numbers, while the white uniforms keep their purple numbers. All three helmets in the video featured a black facemask with a purple section right over the mouth. TCU last released new uniform sets in April 2015, right after the Horned Frogs shared a Big 12 co-championship with Baylor. The old uniforms had a “frog skin” effect. However, TCU appears to have dropped that effect on the main uniforms heading forward. The Horned Frogs will debut the uniforms on Aug. 31, 2019, in the football season opener against Arkansas-Pine Bluff. TCU hopes to build on the three-game winning streak that ended its 2018 season. Click here to get a more detailed look at the uniforms from TCU.